25.02.19 10:37 Transfer Sent Payment: 60.00 USD to account U17249229 from U1294xxx. Batch: 247891249. Memo: Shopping Cart Payment. Deposit to FXOption.biz User allhyips. 02.25.19 09:04	Account	Receive	+8.8	Received Payment 8.8 USD from account U17249229 to account U1*******8. Batch: 247880156. Memo: API Payment. Withdraw to SailorM from FXOption.biz. 02.25.19 07:27	Account	Receive	+4.4	Received Payment 4.4 USD from account U17249229 to account U1******8. Batch: 247867887. Memo: API Payment. Withdraw to SailorM from FXOption.biz. Honestly, the deals provided by FXOption looks too good to be true, I just wonder, who is using this broker, Unless there's a real life proof! 02.25.19 15:18	Account	Transfer	-50.00	Sent Payment: 50.00 USD to account U17249229 from U1---------. Batch: 247930534. Memo: Shopping Cart Payment. 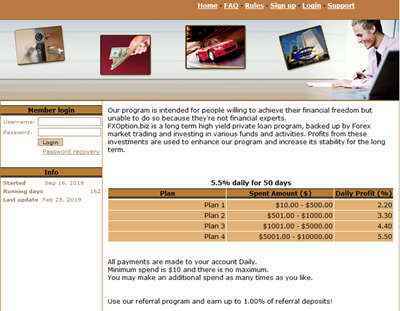 Deposit to FXOption.biz User Onix84. 02.25.19 16:01	Account	Transfer	-30.00 USD to account U17249229 from U15*****. Batch: 247935959. Memo: Shopping Cart Payment. Deposit to FXOption.biz User folks01. The amount of 4.4 USD has been deposited to your account. Accounts: U17249229->U7875094. Memo: API Payment. Withdraw to InvestManager from FXOption.biz.. Date: 09:19 28.02.19. Batch: 248328138. 02.28.19 08:51	Account	Receive	+4.4	Received Payment 4.4 USD from account U17249229 to account U1*******8. Batch: 248324561. Memo: API Payment. Withdraw to SailorM from FXOption.biz. 02.28.19 08:21	Account	Receive	+4.4	Received Payment 4.4 USD from account U17249229 to account U17440278. Batch: 248320519. Memo: API Payment. Withdraw to SailorM from FXOption.biz. 02.28.19 07:51	Account	Receive	+4.4	Received Payment 4.4 USD from account U17249229 to account U17440278. Batch: 248315103. Memo: API Payment. Withdraw to SailorM from FXOption.biz. 28.02.19 09:36;Account;Receive;Received Payment 1.32 USD from account U17249229 to account U1294000. Batch: 248330604. Memo: API Payment. Withdraw to allhyips from FXOption.biz. 28.02.19 08:32;Account;Receive;Received Payment 2.00 USD from account U17249229 to account U1294000. Batch: 248322174. Memo: API Payment. Withdraw to allhyips from FXOption.biz. 28.02.19 08:26;Account;Receive;Received Payment 1.32 USD from account U17249229 to account U1294000. Batch: 248321286. Memo: API Payment. Withdraw to allhyips from FXOption.biz. The amount of 4.4 USD has been deposited to your account. Accounts: U17249229->U7875094. Memo: API Payment. Withdraw to InvestManager from FXOption.biz.. Date: 10:12 03.03.19. Batch: 249100887. 03.03.19 11:17	Account	Receive	+4.4	Received Payment 4.4 USD from account U17249229 to account U1******8. Batch: 249108087. Memo: API Payment. Withdraw to SailorM from FXOption.biz. 03.03.19 10:15	Account	Receive	+4.4	Received Payment 4.4 USD from account U17249229 to account U1******8. Batch: 249101318. Memo: API Payment. Withdraw to SailorM from FXOption.biz. 03.03.19 09:38	Account	Receive	+4.4	Received Payment 4.4 USD from account U17249229 to account U1******8. Batch: 249097030. Memo: API Payment. Withdraw to SailorM from FXOption.biz.